Sony has endured its share of trouble since the 21st century began. In 2000 it began cutting 17,000 workers, 10 percent of its workforce, and reduced factories and facilities by 20 percent. In October 2003, Sony announced it was cutting 20,000 jobs by 2006. It also announced it would cut the component lines for traditionally television from 17 to five in the same period. Sony’s attempt to get into the cell phone market has been a struggle. In 2001, it recalled 1.1 million cell phones over worries that the battery could melt the plastic case and because the phones had a software flaw that made them incompatible with the NTT DoCo Mo network. In the end it lost $360 million and was forced into a joint venture with Ericsson. Sony was also a late comer to the flat screen television market and had to make a deal with Samsung to get a piece of the action. In 2001, Sony announced some its first quarterly losses ever, much it due to a slump in sales of electronic products, which accounts for three fourths of Sony's business. In fiscal 2001-2002, Sony squeaked by with a profit of $118 thanks mainly to strong sales of PlayStation 2. In fiscal year 2001-2002, electronic made up the bulk of its sales but brought in profits of only $125 million, compare to $579 million in games, $203 million in music, $147 million in film and $91 million in insurance. After Sony announced a $927 million loss in the first three months of 2003, its stock plunged 24 percent in two days and the company lost $3.8 billion of its value. Sony blamed the loss on restructuring costs, sluggish sales and a lack of a hit movie. Other factors included competition from cheaper foreign competitors of basic audio and video equipment and delays its it Internet projects. The “Sony shock” sent shudders around the globe. Moody dropped Sony’s credit rating. Investors began examining Sony’s short term results more closely. Afterward Sony CEO Idei said that maybe Sony could learn something from competitors like Dell and Samsung. Profits for fiscal year 2003-2004 were about $800 million and $1.5 billion in 2004-2005, mainly due to success in its movie and division, which produced Prince’s Musicology and popular films like 50 First Dates, Big Fish and especially Spiderman 2. Sales of digital cameras and flat screen televisions rose but sales of traditional goods such as audio equipment were down. PlayStation 2 was also down. The successes seem to bear out that Sony’s effort to diversify was a sound business strategy. The financial services, especially the insurance wing, was doing well. The joint venture with Ericsson was paying off. There were also down sizing efforts. Sony managed to make a profit of $605 million in 2005. Sales of Bravia felt-screen televisions and PlayStation video game consoles and a good performance by the financial sector put the company in the black after the company had projected its first loss in 11 years a few months before. In recent years Sony has been hurt by increased competition, falling electronics prices, and several expensive and humiliating recalls. In August 2006, Dell recalled 4.1 million batteries used in the laptop computers because of risks they could overheat and cause a fire. It was the largest recalls ever in the electronics industry. Ten days later Apple recalled 1.8 million batteries used in Mac laptops. Both recalls involved lithium-ion batteries made by a Sony subsidiary that introduced small metal particles in the manufacturing process that could can cause computers to short circuit or catch fire. The recall ended up affecting almost every major maker of laptop computers, which were all using Sony batteries. In all 9.6 Sony million batteries, most of them in 7.74 million laptop computers made by Dell, Apple, Lenovo, IBM, Toshiba Hitachi, Fujitsu and Sharp, were recalled. Toshiba recalled 830,000 computers and was contemplating suing Sony over decline in sales and impairment to its brand image. Hewlett Packard and Gateway computers used the Sony batteries but were not involved in the recall because the batteries were configured in such a way there was no risk of overheating. The problem first surfaced when someone video-taped a computer catching on fire at conference in Osaka in the spring. Sony was aware of the problem several months before that but didn’t act. The video of the fire was widely circulated on the Internet. Altogether there were 10 reports of computers with Sony batteries overheating. The recall cost Sony around $500 million and badly damaged its reputation. In August 2007, Sony recalled 66,000 digital cameras to fix a defect in the adhesive strength of their bottom that cold cause minor hand injuries. In September 2008, 440,000VAIO TZ series laptops were recalled to repair a defect that could cause overheating. According to Sony, seven people in Japan and abroad had been burned due to overheating, In October 2008, Sony recalled 100,000 of its lithium ion batteries used Helwett-Packard, Dell, Acer, Lenovo in laptop computers due to overheating concerns. On top of that Sony was overtaken by Apple in portable music and Sony, Fuji film and Maxell were fined $110 million for forming a cartel to fix the price of videotape sold in Europe. Sony was caught off guard and it reputation as an innovator was tarnished by Apple’s release of the iPod and iPhone and Nintendo’s release of Wii. Some complain that Sony products have become over-engineered, and too complicated and expensive, scaring off ordinary consumers. In 2007, Sony ranked 41st on Fortune’s list of most admired companies, much lower than it had ranked before. Sony recorded losses in its game divisions despite good sales in late 2006 because of PlayStation 3's high production costs. The loss offset gains made by good sales in consumer electronics like televisions and digital cameras and hit movies such as Casino Royale, The Da Vinci Code and Spider Man 3. Sony returned to annual profitability in fiscal 2007-2008 for the first time in three years. The company posted record high net profit of ¥369.4 billion on record high sales of ¥8.87 trillion.Cost cutting and shedding peripheral businesses seem to work. Since 2005 Sony had exited or downsized 15 product categories, reducing 10,000 global workers and shutting down 11 manufacturing sites. Sales and profits rose in late 2007 as flat screen televisions, digital cameras and consumer electronics began selling well and PlayStation 3 started to sell well and become profitable after a price cut. Stock prices drops over concerns over a strong yen in the beginning of 2007 but rose towards the end of the year when a Dubai fund bought a substantial chunk of the company. Cyber-shot cameras and Vaio personal computers sold very well. The sales of Bravia LCD televisions picked up but the television business remained in the red because price declines amid global competition. In June 2008, Stringer said the top priority for Sony was returning the gaming and television divisions to profitability by the end of fiscal year 2008-2009. He outlined a strategy for Sony to regain its lead in televisions, return the gaming industry to profitability and release movie service for Internet users. Sony post $2.27 billion in losses in fiscal 2008-2009, the first annual loss in 14 years and the largest loss ever, as a result of the global financial crisis. The electronics division was particularly hard hit as consumer spending dried up. In December 2008, Sony announced a major restructuring plan to deal with global economic crisis that included 1) cutting 16,000 jobs worldwide (about 8,000 regular workers (5 percent of its workforce) and 8,000 temporary workers), 2) reducing the number of manufacturing sites to five or six by March 2010, 3) cutting purchasing costs by 20 percent by halving the number of parts suppliers, and 4) cutting investment in the electronics division by 30 percent in fiscal 2009. The measures helped Sony reduce costs by more than $1.1 billion in fiscal 2009. In April management was reshuffled in the unprofitable game and television businesses. The job cuts were among the largest made by an Asian company in the crisis. Many analysts thought the move did not go far enough to streamline the company and felt a lack of investment jeopardized Sony ability to remain competitive in the future. In February 2009 it was announced that Sony President Ryoji Chubachu would step down and be replaced by Stringer who would serve as both company chairman and president. To make up for losses in sales Sony raised money through the sale of $2.2 billion worth of bonds in the largest bond sales ever. In May 2009, Moody lowered Sony’s debt rating to A, citing the slumping electronics market and intensifying competition. Sony Ericsson lost $245 million in the third quarter of 2009. In September 2009, Sony announced it was going to sell its LCD and television plant in Mexico to a Taiwan firm. In 2008 Sony posted its largest ever annual loss, $3 billion. Sony posted a loss of ¥63.4 billion in the first half of fiscal 2009 (April-September).In late 2009, Sony said it probably wouldn’t return to profitability until 2013 and predicted that 3-D products will earn the company ¥1 trillion in annual revenue by that time. 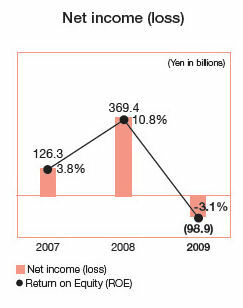 Sony lost about $3.1 billion in fiscal 2010-2011. Sony had previously forecast a $800 million profit and said much of the loss was due to a $3.7 billion “non-cash charge” related to tax credits. At that time Sony estimated that losses associated with March 2011 earthquake and tsunami would be about $1.8 billion. At the end of 2010, Sony’s sales of televisions grew by 44% and those of its computers rose by 28%. Its gaming and mobile-phone activities turned profitable in 2010. The television business still suffers losses, but is in better shape than it used to be. In May 2011 The Economist reported: “Before an earthquake walloped ten of Sony’s Japanese factories, the firm was expected to report a net profit of ¥70 billion ($817 million) for the year to March 31st 2011. But the quake will have cost it some ¥17 billion that year and ¥150 billion the next. The cyberattacks will also cost billions, says Sony. Analysts guess that the breaches could cost Sony ¥100 billion. Adding to the misery, Sony was forced to revalue the tax breaks (accumulated from previous losses) that it expects to deduct from future tax bills. The company reduced these “deferred-tax assets” by a hefty ¥362 billion. This does not affect its operating profit or cashflow, but it forced Sony on May 26th to report a net loss for 2010 of ¥259 billion. Sony was stung by the global financial crisis. In 2009 things finally began improving after an aggressive cost-cutting drive and a revival in sales. In the final quarter of 2009, Sony surpassed analysts’ expectations with a sevenfold increase in profit to $853 million. In fiscal 2009 Sonay made a profit of ¥31.77 billion thanks to cost-cutting efforts, brisk sales consumer electronics, including televisions, especially middle priced version of products such as flat-panel televisions and strong sales in the gaming and personal computer divisions. In the April-June quarter of 2010 Sony made a profit of ¥25.7 billion thanks to strong sales of televisions, Playstation 3 consoles and computers. In the July to September quarter it reported net profits of ¥31.1 billion ($385m), having made a net loss of ¥26.3 billion a year earlier. In the period from April 2010 to December 2010 it profits increasing eightfold. While traditional strong points have been underperforming lately there are new signs of hope. As of fiscal 2010-2011, Sony has lost money in its core television business for seven years straight. But it is doing well I emerging markets. In India its is outperforming rivals such as Apple and Samsung. It has the No. 1 market share in flat screen televisions and controls a 34 percent share of the digital camera business. Sony owes is success to strong brand image, generous advertising spending, good relations with small and medium-size retailers and a strategy of targeting consumers with an annual income of $10,000 or more. Ten Sony plants were crippled by the earthquake and tsunami in March 2011. In early June the 10th and last of these factories---a plant in Tagayo, Miyagi Prefecture that makes magnetic tape and blue ray and other disc media---restarted manufacturing in early June 2011. Despite creating the market for portable music with the Walkman, Sony has largely missed the shift to digital music-players. Between August 2002 and July 2010, Ipods outsold in personal music devices in Japan. In August 2010, Sony finally regained the No. 1 position in portable music players in Japan. The iPod from Apple dominates digital music players. The iPad dominates smartphones and the iPad dominates tablets. Even in Japan between August 2002 and July 2010, Ipods outsold in Sony’s personal music devices. In smartphones and tablets Sony is now a bit player. Compared to Apple, Sony seems to have lost its touch for coming up innovative products that people crave for and have to have. Plus it also seems to have lost its ability to effectively market the innovative products it has produced. New Strategies, and Sony Coming Back? One of Sony’s main strategies is to integrate is hardware and software businesses and utilize the Internet to do this. Although video game hardware and software sales have declined globally, the PlayStation Network---a system that links gamers worldwide in live play--- is a key initiative for the electronics company, which brings in an estimated $500 million in annual revenue. The network---which allows users to upgrade and download games and other content’serves both the PlayStation video game machines and Sony's Qriocity movie and music services. With increased competition in North America and Europe, namely from Samsung, Sony has accelerated market development efforts in emerging markets in countries like India and China, where price competitiveness is crucial and every effort must be made to cut costs, This focus was behind, for example, Sony’s decision to pull of making LCD screen with Sharp in Japan. In March 2010, the New York Times reported, Sony unveiled a new retail concept in Nagoya, which the company plans to introduce worldwide if it is successful. The Apple-store-like stores are an effort by Sony to showcase its entire network of products. Displays at the store show how various gadgets can work together: a camcorder, Blu-ray player and TV, for example, or a camera, Vaio laptop and digital photo frame. The store got off to a flying start. More than 300 people lined up for the March 17 opening of the sleek space, designed by the architect Tadao Ando. A line quickly formed in front of Sony’s new 3-D televisions.